We were minding our own business, heading out on a pleasant little Saturday morning trip to a shopping area, more as an outing than an expedition. Stopped for a red light at an intersection, all was was quiet when suddenly –BOOM– a heavy blow from behind rocked the Insight! A second later we realized we'd been hit by a large black car. I shut off the engine, carefully got out of the Honda –the guy who hit us was already out of his– and we examined the results. (He said he "thinks" his foot slipped off the brake at the stop.) Whew! Nobody hurt. No broken glass. No smashed plastic lenses. No folded or torn bumpers. The Insight, however, now wears as part of its rear bumper the distinct impressions of the other guy's license plate bolt heads (you can count the sides) and license plate frame. Of course, the other guy showed no signs of impact on the front end of his car. Probably nothing to be done but application of a bit of touch-up paint and. Too little damage for a call to the police or a call to the insurance company. So we were given the guy's license info, shook hands, and parted company. 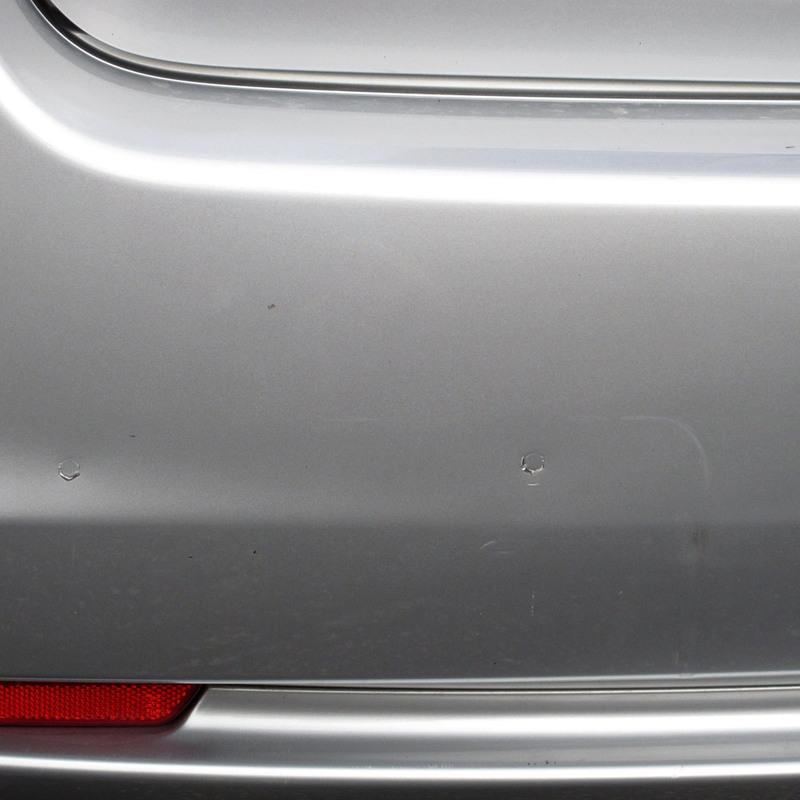 I think I know what I'll do about the bolt impressions –a new bumper sticker will do the trick– but some small scuffs and scratches will be harder to hide. The Insight is only a bit over a year old and was unscathed up to this point. Now it has its first permanent marks and I'll be reminded of the incident almost daily. Being hit is always a shock. I am glad no one was hurt but I know it but a huge damper on your day. I am glad it was not worse. Oh, you added a picture. Darn…those are prevalent dents, aren't they. Ugggg. Oh man! Bummer! I feel your pain and know what it's like. Sorry.